These are images of works of art that can be found in the St. Louis Art Museum. They were taken with a high resolution camera, so you will be insured of very detailed reproductions. They each have their own distinct ratio in size. Please take care choosing a size and cropping when you are directed from here, offsite, to Fotomoto to complete your order. For each, there will be a crop window for you to see how the image will fit in the size you have picked. I believe most are suited for 11 x 14 but of course one can go smaller and one can go as much as four times larger. These images are available on different medium, from photographic paper to fine art paper and from canvas to wraps and wall peels. The resolution of these is very high, so they will print up to 40" x 60" and not lose much quality. Just click on the "Buy Print" button beneath your image of choosing and you will be directed to an options page for some decision making. Paypal is used for check-out. For purchases over $99, Paypal offers no interest if paid in full in 6 months. A climber, Charles Gough, fell to his death in 1805 in the Lake District region of northwest England; his faithful terrier, Foxie, kept guard over his body for three months. Foxie was found to have not only survived the months beside her dead master, but had also given birth to a puppy, which died shortly afterwards. Edwin Landseer, England's most famous animal painter of the 19th century, depicts the emotional bond between man and dog, showing the terrier pawing in vain at his master's chest as if to try to awaken him. This painting was exhibited in 1830 with lines from a poem, "Helvellyn" ( part of Gough's dangerous accent ), by Sir Walter Scott.This is a high resolution shot of the actual painting that hangs in the Saint Louis Art Museum. The LG Potter watermark will not be on your image sent to you. Haying Scene ( 1884) by Julien Dupre ( 1851-1910 ) Fine Art Reproduction. 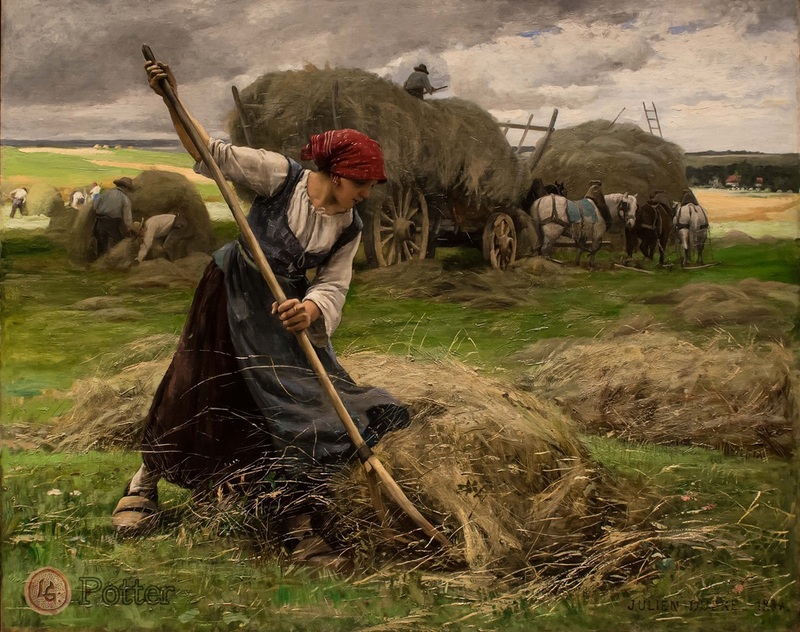 12" x 9.5"
By the 1880's, France's agricultural economy was suffering difficulties, but Julien Dupre presented and idealized view of attractive peasants happily working in the fields. Here a young woman arranges hay to make stacks which will be loaded onto the cart behind her. 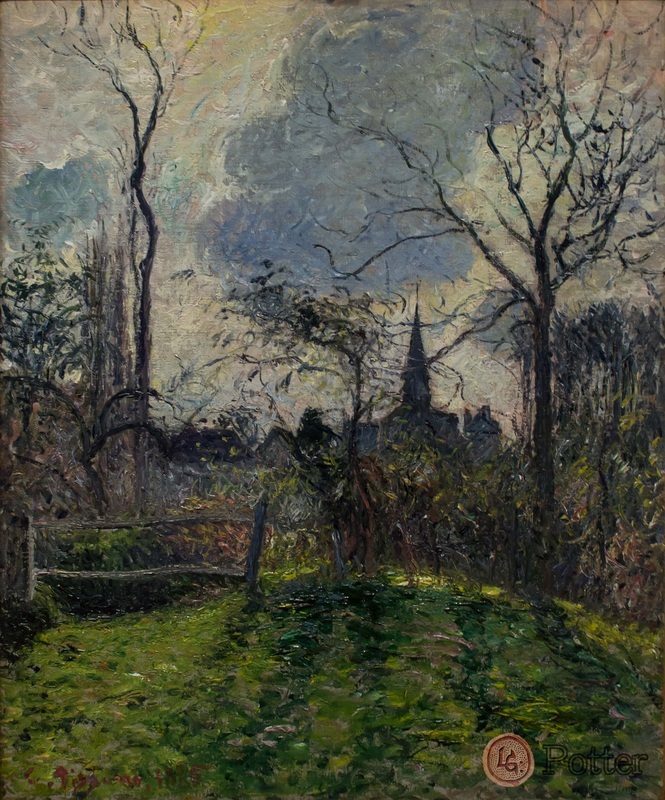 Dupre's rendering of the stormy sky ﻿shows the sensitivity to the weather conditions. 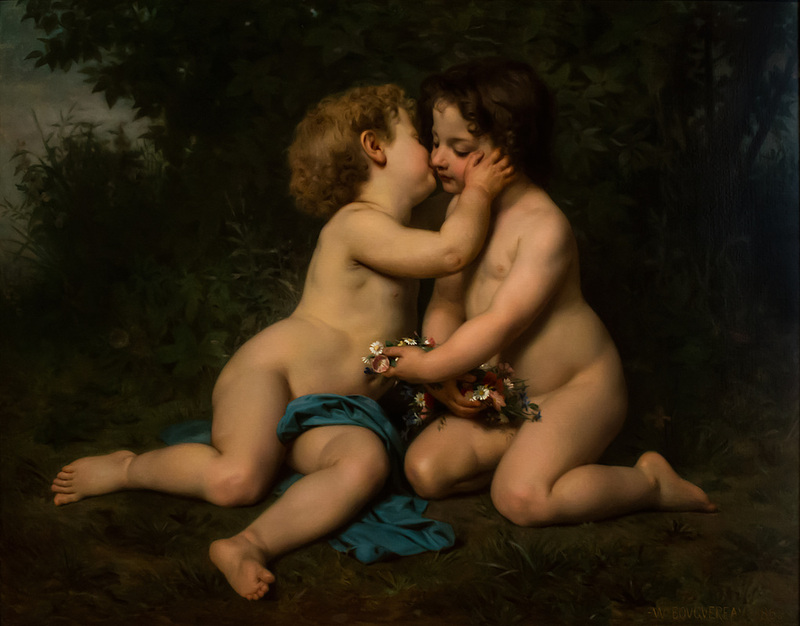 Dupre trained as an academic painter and developed a style featuring impeccable draftsmanship and rich color. This is a high resolution shot of the actual painting that hangs in the Saint Louis Art Museum and is one of my very favorites there. The LG Potter watermark will not be on your image sent to you. The Bell Tower of Bazincourt (1885) by Camille Pissarro (1830-1903) Fine Art Reproduction. A luminous sky backlights this scene, silhouetting the village church and casting a pattern of dramatic shadows in the foreground. Camille Pissarro produced forty views of the picturesque village of Bazincourt, some fifty miles to the northwest of Paris, and close by Eragny where he lived for the last two decades of his life. The artist signed his work in red at the bottom left to stand out against the complementary color of the surrounding greens. I like the brush strokes and colors in this Impressionistic work. There appears to be a rhythm within it. This is a high resolution shot of the actual painting that hangs in the Saint Louis Art Museum. The LG Potter watermark will not be on your image sent to you.